Following on from Raynerd's question about CAD. 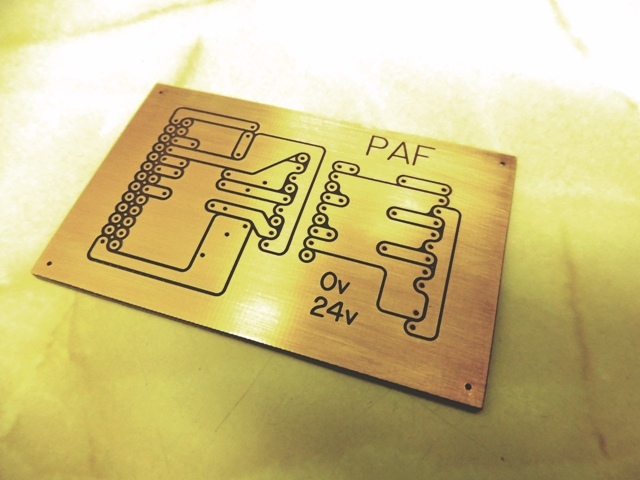 What software can anyone recommend for laying out PCBs and preferably for giving an output in G Code for CNC milling? I've just made one but had to manually draw the path of the cutter in Autocad before importing the DWG file into Vectric Cut 2d to produce the G Code. It took too long to get so far and then only a few minutes to machine. There must be a better way. I used a home made carbide engraving bit with a 0.5mm dia tip. It was made from the shank of a broken end mill. I use Eagle for PCBs. http://www.cadsoftusa.com/ The free version has a limited size for PCBs. There is a program called pcb-gcode http://www.pcbgcode.org/ which converts the output to g-code. Since CNC is still on my to do list I can't say how well it works but Eagle works very well. The free version of Eagle has a 100 x 80mm limit. This is twice the are of my board which is (80 x 50mm) and would probably cope with anything I'm likely to do. I'll download it and have a play. Am I doing something stupid? I went to the CadSoft site and the Eagle Overview page. I clicked on Download Now under the Freeware option. A couple of clicks later and I'm presented with a cost of 74.40 Euro! I've tried several times and always get the same result. Edit: I found I have to download the full version and then just select "Run as Freeware" once it's installed. This wasn't too obvious - honest! I'd recommend DesignSpark from RS. It's completely free (even for commercial work) upto IIRC 5 licenses, there's no limitations to board size or number of layers, and it has an autorouter! I doubt it'll output G-code natively, but it'll produce DXFs (CamBam will convert those to G-code) or Gerber files (and others, I've not checked them out). You can even design the schematic & use that as a basis for laying out your board. I've used it a few times to design boards (not that I've ever built one.... but I hadn't considered the idea of routing the board using a CNC machine....), and it seems pretty darn good to me. You also get to use the entire RS catalogue of components out of the box, so it should have suitable pad layouts for most of what you'll ever make. I'm glad to hear you've cleared the first hurdle. I've always found the free version board size plenty for my projects too. I've never been bothered by being restricted to only two layers either. As with the CAD stuff on the other current thread the first steps are always the most difficult. As I recall some of my initial difficulties were dumbing it down enough. It's all very well the autorouter wanting to put three tracks between the pins of a chip, but the board has to be etchable and solderable using my skills. I found that the software could cope quite well once I found out how to make it do what I wanted. Please ask if you get stuck. If you are happy defining pad layouts for any IC package not in it's default library, then use any PCB package you want. If you don't fancy spending 20-60minutes just defining each new chip then you have to use a PCB package that is used by enough other people that there is a chance that someone else has done the work for you. That means Protel,Eagle, or maybe Kicad. 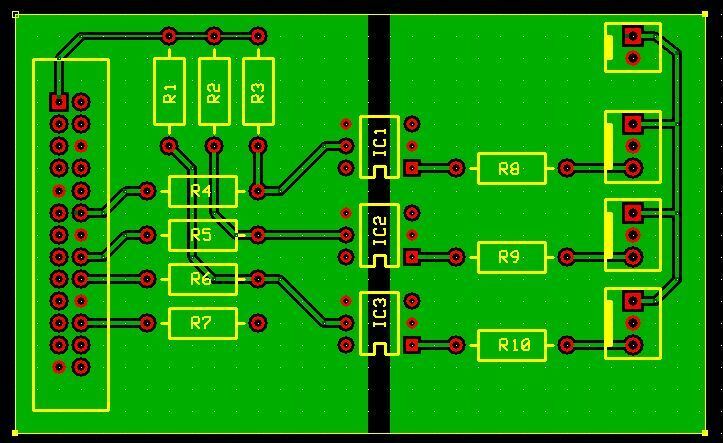 Of these only Kicad is free, the free version of Eagle has too many restrictions to be useful. Like all CAD, there's a bit of a learning curve, so choose wisely. We develop PCB's for a living, so our perspective is a little different. We couldn't afford Protel, Kicad wasn't around a few years back and still has limited libraries (although I understand there are now import scripts for Eagle libraries), that left Eagle which I have about 5 licenses for. We pretty much hate the user interface but, having put the hard yards in to learn it, and spent the money to buy it, we'll probably keep using it. Ahh you youngsters don't know how lucky you are these days. An atuorouting pcb package for free that runs on a laptop! In the late 70s working for ICL in West Gorton, Manchester, our department (call DA - Design Automation) were developing the software to layout/route/track/test 14 layer pcbs about 18" square and 1/4" thick for our mainframes. The auto router program used to run for hours on our biggest mainframe and at the end the design may have 20 or more "handwires". There were competions in-house to re-route the boards and reduce the number of handwires! I've always used Eagle and although it has quirks (what software doesn't?) it is more than capable and has a lot of flexibility to add your own parts. The UI is a bit stupid but get past that and it isn't that bad to use. They've always had a free version and most hobby projects can be completed with it. If you get beyond that, design in modules or just pay for it. Disregard the autorouter. You can do a better job on your own most of the time. Use the grid with snapping and only turn it off when there's a good reason to do so. I use a combination of Eagle (free) with the pcb-gcode.ulp to generate the files. Then I also use autoleveler for probing the board prior to "etching" to adjust the gcode for the irregularities in surface height. Works very well for me. As noted above, you can find it at pcbgcode.org or there is also a yahoo group which is generally more active. Thanks everyone for all the replies. It looks like I'll have to learn to use Eagle and pcb-gcode as this seems to be the only route through to g-code so I can mill the tracks. I installed Eagle and tried last night to build a schematic without looking at any tutorials and failed miserably. It doesn't seem very intuitive but it must be better than drawing the toolpaths in Autocad. Can I miss out the schematic and go straight to putting components on the board and joining them up with tracks? I'll also look at Autoleveller. I've set a deep cut (0.25mm) to allow for uneven board thickness (and even more uneven MDF under the board). Autoleveller might help with other problems as it appears to work with any g-code - not just pcbs. When I started trying to figure out Eagle, I found a lot of excellent resources on youtube videos. Give it a search and you will find a ton of them. Various authors present it in slightly different ways so pick and choose one that suits you. I "think" I have seen were some have gone directly to the board level, but after getting into it, it was easier for me to start with the schematic and then build the board. That way, I only had to directly concern myself with one process at a time. I built the schematic and made sure the connections were correct and then when I did the board, I could concentrate on where and how to place the components. I second Art's opinion. I find it much easier to draw the schematic and then go to the board - it shows all the connections you have to make between the components - it keeps track of what you've connected and what you haven't. To me that is the best bit about the program. 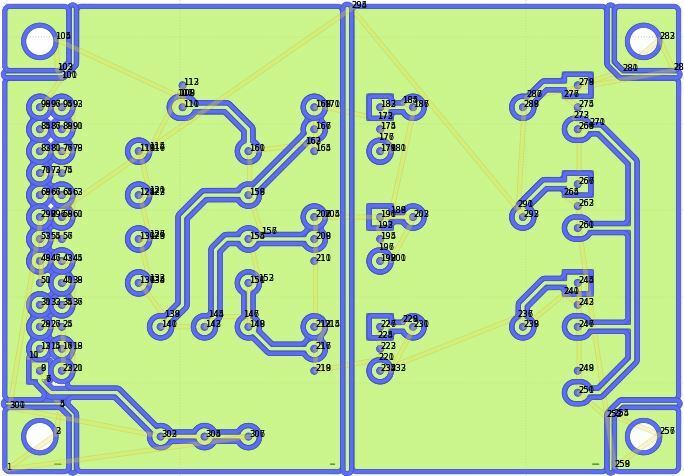 A bit late ,but I have just realised that the software that I just bought "Circuit Wizard PRO" can do circuit boards layouts , CAD/CAM feature , exportable as Gerber Files , dxf and NC drill . Software can be purchased at Maplins . In eagle, everything starts with the schematic. I don't think you can skip it even if it were a good idea - which it is not. I wouldn't call that contradicting. You're correct that it can be done, but that's not the way that the software is designed to work. It's much easier to make changes and understand the circuit with a schematic too. In my opinion, anyway. To each their own. Either way, it most definitely beats a generic CAD program. I've watched several Eagle videos and I'm afraid it looks to complicated for me. I'm only ever likely to want to produce very simple PCBs and mostly single sided if I can get away with it. I tried a simple schematic but soon got fed up of trying to find the components I wanted from the many thousands in the library. Maybe I'm too impatient and might try again. I saw it had an export to DXF feature but, to my extreme disappointment, found it didn't export the tracks - only the pads. There was no way of exporting even as a Gerber file - you had to order the PCBs from ExpressPCB. I've now uninstalled it. You can, and we do. 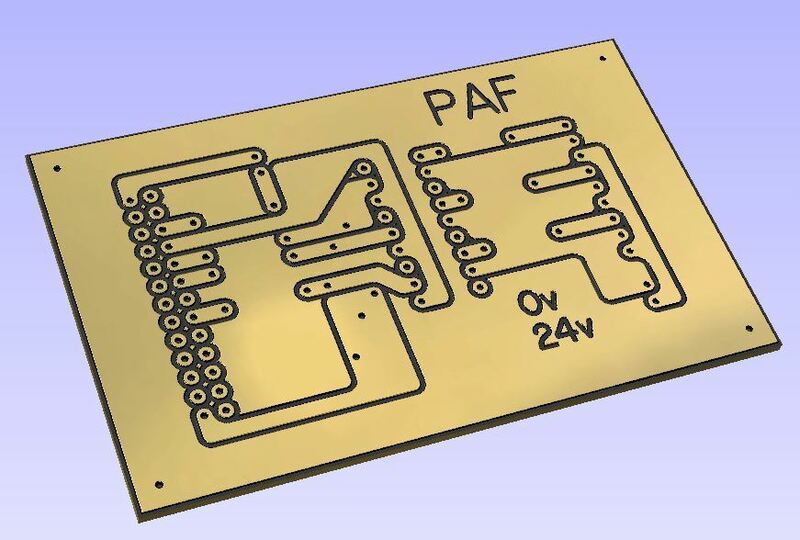 We design all our boards (our biggest has about 500 components) directly in Eagle PCB. It's just the way we think I guess. Having spent too many hours installing and trying several different PCB packages I've found one which I think does everything I need without a prolonged learning curve. Ade/Rob - I tried Design Spark and and PCB Wizard - neither of which were ideal. PCB Wizard was much easier to use than Design Spark but I couldn't neatly connect a pad to a copper plane. However hard I tried I couldn't get Design Spark to give me 0.5mm isolation to match my cutter. I've installed Dip Trace as a 'not for profit' user and they emailed me a registration code. The free version is limited to 500 pins and 2 layers but that's fine for me. 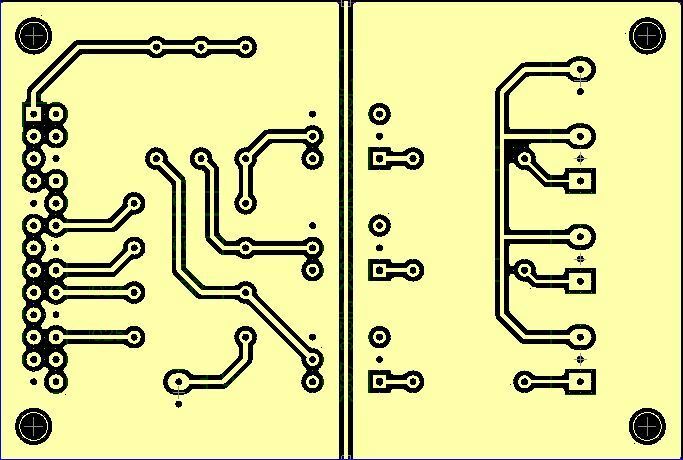 It took quite a while to draw my PCB but I'm happy with the result. 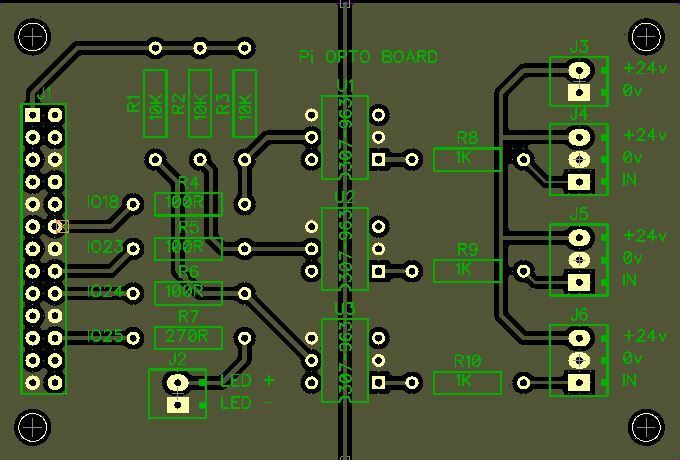 It looks as though with all the packages I've tried you can skip the schematic stage and go straight to the PCB stage which suits me for something so simple. Now to check out Gerber to g-code conversion. FlatCAM seems a very able Gerber to g-code program although a bit strange to use. I might thicken up the tracks a bit then try milling.